Eat more fruit; we all know that fresh fruit is good for us! Sweet Sensation brings you all the natural goodness of fruit. It’s so refreshing, it doesn’t need peeling and it doesn’t drip, that’s what makes it so sensational. Your kids love Sweet Sensation. 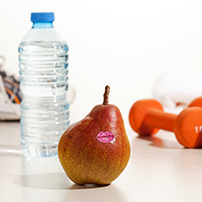 No more snack bars, crisps and biscuits to school: pop a pear in your bag and off you go, hassle free health! There’s more to natural goodness than a few vitamins in a tasty pear. Sweet Sensation is packed with fibre, providing about one fifth of your daily fibre needs. It has more pectin than an apple, which helps lower your LDL cholesterol level. Sweet Sensation is full of vitamins B2 C, E, and copper and potassium - a natural multivitamin pill, as well as a powerful antioxidant and source of trace minerals. Pear power to keep you going! Babies love pears, and pears love babies. 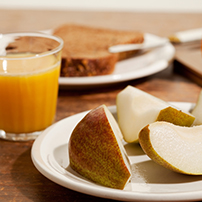 Pears are hypo-allergenic, therefore unlikely to cause any allergic reactions. Sweet Sensation combines all of this natural goodness and helps your baby grow naturally and healthily.